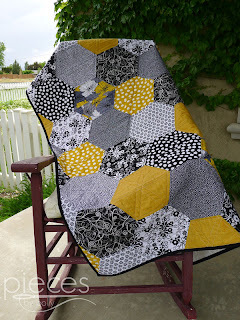 I'm excited to be part of the Quilter's Blog Hop Party hosted by Michele of the Quilter's Gallery. I'm offering two lucky winners a copy of my Hexies by Halves PDF Quilt Pattern. I love this pattern because it's so fast and easy to put together. The pattern has been thoroughly tested and successfully completed by beginning quilters. Be sure to stop by and check out all the other great giveaways going on here. If you've got a quilt on your to-do list for Christmas, this is definitely one you can get done in a weekend, and the pattern includes instructions from start to finish...everything from fabric selection all the way through binding your quilt. It's also got instructions for some alternate backings that are fun enough they could be a top themselves. 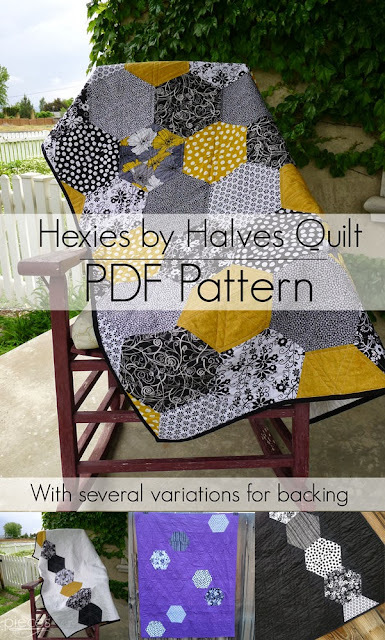 If anyone wants to purchase the pattern, you can use the code "GIVETHANKS20" FOR 20% off the purchase of the Hexies by Halves Pattern in my Shop. If your purchase the pattern during the giveaway and then are one of the winners, I'll refund your purchase. You might also be interested in joining me for a free Nativity in the Trees Quilt-Along going on now. For Christmas I have a few more stockings to make and then I'm starting (and hopefully finishing) and special quilt for my husband. Anything beyond that I'd like to get some pot holders, oven mitts, and matching placemats done for my own kitchen. I am making couch pillows and tablerunners. And I am working on my Nativity Trees and really like it. I've got nothing planned for Christmas--how sad! I am thinking about snowflakes though! My biggest project is a table runner, but a lot of little projects, too. 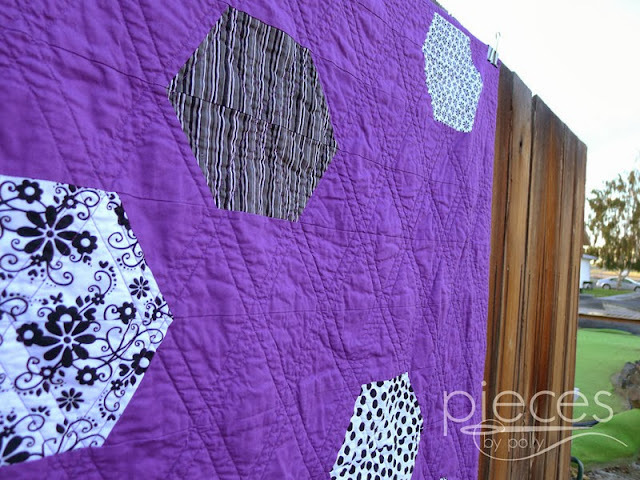 Oh gosh I would love this pattern....how could I not want it after seeing the lavendar quilt on your page...If by chance I do win reach me at skeetersaw@comcast.net. I'm working on some dolls ("boy buddies") for my two little boys this year. There's a new baby on the way at our house and I am hoping that they can practice being nice to the new baby through the dolls. I have a Christmas tree skirt and quilt I am attempting to get done. I love this quilt. I like hexagons but they just look to hard. I think I could do this one. For Christmas I'm currently making a dining chair backing cover like Santa's hat. I'm adding some bling to my Dresden Plate wreath. I'm working on the QAL, working on flannel sleep pants for everyone on the sly of course. Making a special pillow and quilt for my mom but so far I am only getting the pillow done and I need to finish my "virgin" quilting project for my in-laws that is still only half way done. I only recently started quilting and everything I know I learner online! 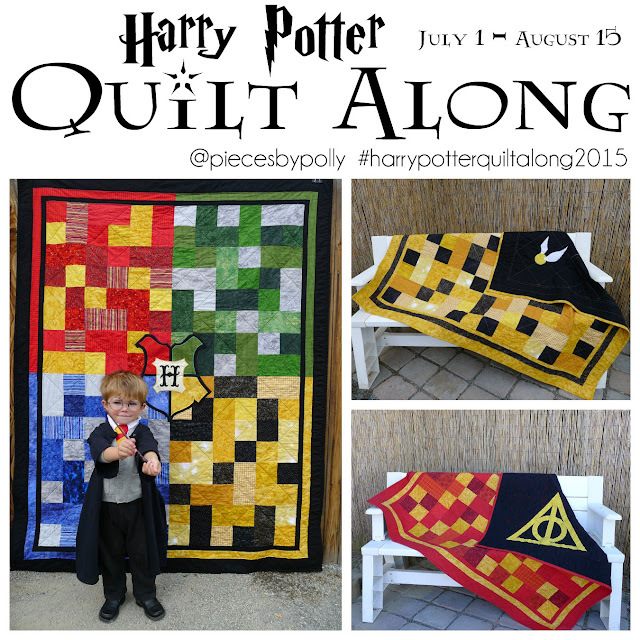 I love this pattern, it would be a perfect project for a quilt for my son. Right now I am working on a Christmas stocking! I already made a bunch of star ornaments. I'm giving each of my children a quilt. =) Thanks for a chance to win. thank you for participating! & a chance to win! finishing a quilt for my momm! I've got some Christmas quilt tops finished, just need to get them quilted. Thanks. I plan on making a set of placemats and a table runner for my dinner table. I'd like to make a tree skirt and some new pillow cases for my children, thanks! I'm making table runners and matching hot pads (trivets) using a cute chevron pattern for my girls. I can always use a quick pattern to make for gifts, and I've never done hexies before. yoyopattycakes@hotmail. 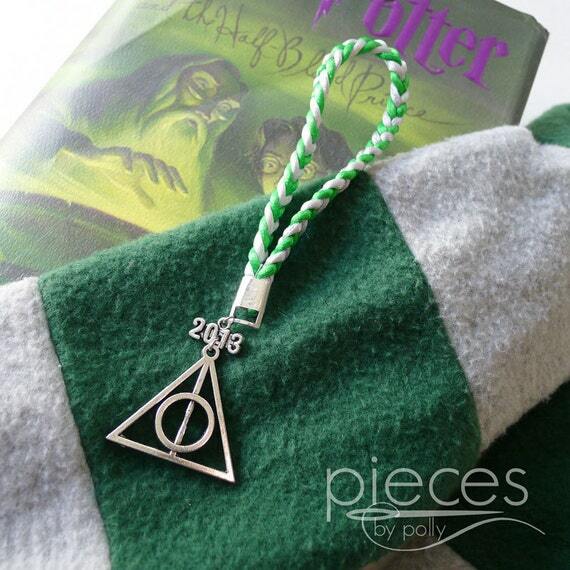 I'm only making one thing this year, and it's simple : a fleece throw. Your quilt pattern is great. I like your pattern for large hexies. I am making table runners, pot holders, microwave bowls and a couple tote bags. I have kitchen towels made and now am working on matching potholders. 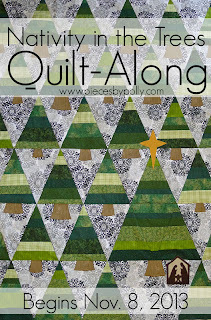 I'm getting ready to make a "Deckade the Halls" quilt using the Fat Quarter Shop's quilt along. I plan on making my mom a purse. Thanks for the opportunity to win! I am not planning on any sewn/quilted projects this Christmas. I am making some beaded ornaments. I am making a quilt for my brother and his wife...and I am almost through. I should be looking for fabric for mug rugs tonight so that I can sew tomorrow. 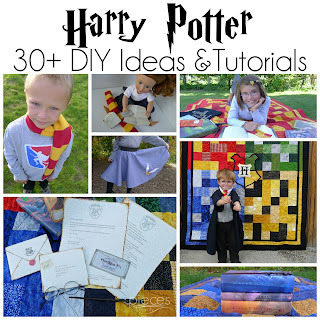 So much fun visiting all the blogs and seeing all the creativity and wonderful giveaways to win and sew wonderful quilts. I'm currently making an Advent calendar for my new granddaughter. And one of my friends wants me to make her a raggedy Ann doll. I might get that done for Christmas. I am working on an Elm Creek Christmas quilt. Hope I get it done! I'd love to be able to make a quilt in time for Christmas to add some seasonal cheer to my living room, but I didn't think that I could possibly get it done. 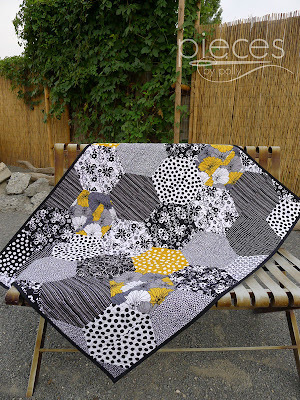 With your beautiful quilt pattern (I love hexies! ), it might still be possible. Thanks for the chance to win. 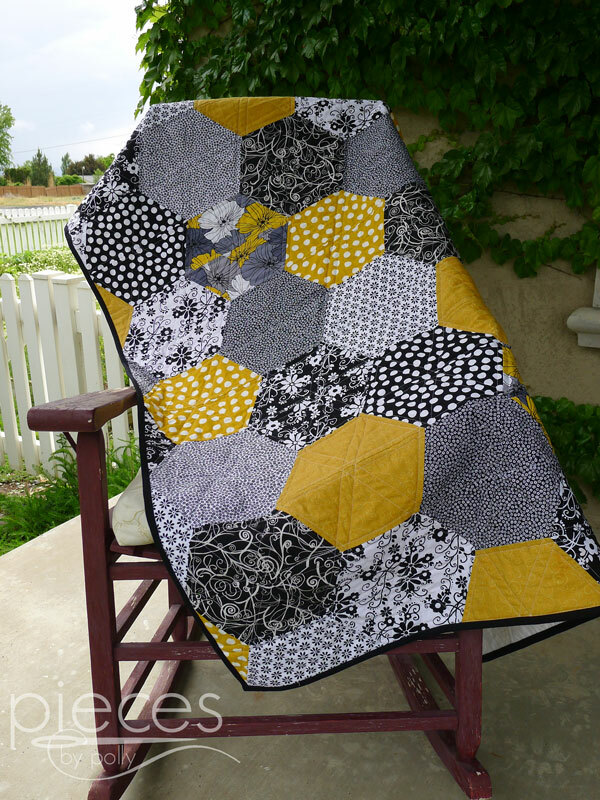 Since this quilt is for beginners and can be done in a weekend, that's for me. I am SO a beginner. Would love to have the pattern. thanks for the chance to win. 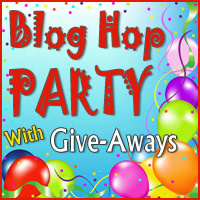 This blog hop is so much fun. Right now I am finishing up some placemats for my grandkids. I started them last year then got distracted with other projects. Hope to stay on track this year. Fun pattern, thanks for the give away. Going to make pajama pants for everyone :) Thanks for the give-away. I am making some snowmen mug rugs to give as gifts to my friends. I am also making shopping bags out of Christmas fabric and will use them for wrapping presents. Then, instead of throwing away paper, I'll be reusing them for shopping! Thanks for the chance to win! I am in awe of your qluilt! It is beautiful! This year I am making pjs and tablerunners! I don't have any specific projects for Christmas but am working on a Swoon quilt and a Penny Patch quilt along quilt. I making a quilt for my Mum for Christmas. I also would like to make two doll quilts for my daughters and... maybe I can get some Christmas decorations made in time too! I am working on some rag quilts for family members. I'm not making anything for gifts this year. I feel lazy! Unfortunately, I didn't plan ANY projects for christmas gifts this year! Shame on me! I am making a tree skirt, and some fabric baskets. I currently do not have any projects planned for this year. I am working on a quilt for my dad that I hope to finish hand quilting by the holiday, but my machine is in the shop and I am not sure that I can finish before Christmas. Haven't tried hexies yet, this looks do-able for me! Thanks for the chance to win. 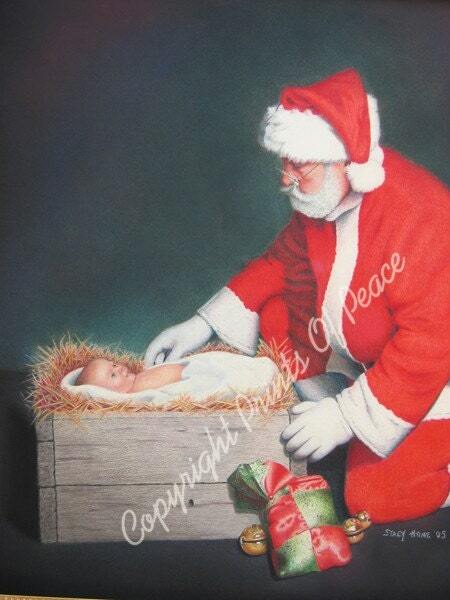 Planning on making some Christmas bibs and some doll quilts for grand kids. Thanks for hosting a lovely giveaway. I love this pattern!!! I'm making an Advent Calendar and a Christmas stocking. What a lovely pattern! If time allows I want to create potholders and machine embroidered tea towels for family & friends. In the Netherlands we have ' Sinterklaas ' on December 5th. I am knitting a doll for my daughter who wants to be a stewardess. I make one for her :-) Thanks for the chance, a great price! Two throw quilts and two pillows are on my project list! I have 2 lap quilts for my home (first Christmas quilts!) and some mug rugs planned for gifts. I have a few Christmas projects on the go...mostly gifts but decided to try and get a whole Christmas quilt done - wish me luck! I'd love to have a go....!! Vintage aprons, iPad covers, zip pouches. Thanks! For Christmas I am making my four year old daughter a doll diaper bag with cloth diapers, bib, wipes and blanket . I've been sewing small gifts for the grandchildren, novelty pillow cases and aprons. I've made several throws, and still have two more to finish. Thanks for this opportunity. Your quilts look wonderful, I love the fabrics. And the backs are beautiful.